'Environmental culture is "The way we do things for the environment around here", including the shared assumptions, beliefs, values and norms, actions as well as artifacts and language patterns. 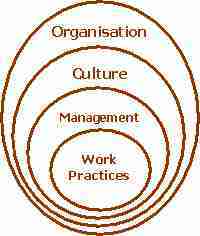 More on organisational culture. We have a "hard copy" course called 'Develop Environmental Culture' . It is a 2-day programme that takes you through workbased activities aimed to develop an 'environmental culture' that can improve company performance and sustainability. Organisations wishing to involve skilled workers and other staff in the process of managing their environmental impacts and improving environmental practices will find this short course a useful tool for promoting and developing an environmental, or sustainable, 'culture'. This programme comes with a comprehensive trainers guide to delivering the workshops and is available as a pdf download on your site. Ascertain main characteristics of sustainable development. In the future, we want to develop this course into an online "Develop Environmental Culture" programme that follows the directions of Step 2 of Managing H&S, which emphasises communications, control, competence and cooperation to promote a positive environmental culture. iIn this new programme, we would like to include experiences of people introducing environmental changes within their organisation's culture, playing with the 'hands' on our home page, and channelling their comments through "submit" button. Thank You.